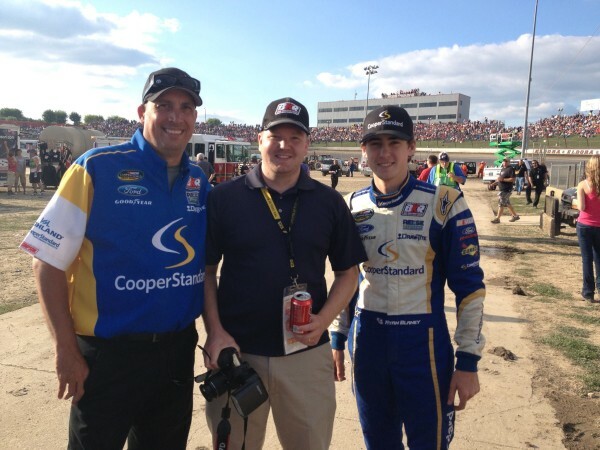 An interview with vetern spotter Charli Brown, who currently works with Ryan Blaney and Andy Seuss. Q: Charli, I’ve known you for years through similar online interests, and finally got to meet you this past summer at Eldora. For as long as I have known you, you have been spotting and working for race teams in the Charlotte area. Can you explain some of the different types of events you have spotted at? A: Good Question. I started right off the bat with Chad Little when he drove his own Tyson Farms #19 Ford in the then Winston Cup Series at Charlotte. I honestly had no clue what I was doing at the time but went back and started again with NASCAR Modifieds, NASCAR K&N Pro Series, various NASCAR, CRA and PASS Late Models as well as the ARCA Racing Series and now the NASCAR Camping World Truck Series. Q: NASCAR has announced some new rules for spotters, and more specifically, the equipment used. Can you explain some of the changes and how this might affect you? A: Honestly, it doesn’t effect me at all. I still use whatever radios the teams supply me with. The full time spotters in the Sprint Cup Series have had it a little tougher. Mostly with the digital radios they used to communicate with the team. That was basically a closed channel between spotter and crew chief. NASCAR has eliminated that and written the rule to read “Analog Radios Only.” Most Sprint Cup Series spotters were using four radios on the roof. One for Channel One to communicate directly with the driver, One for Channel Two to communicate with the team and crew chief (as to not disturb the driver with unnecessary information – digital radio) One to specifically scan NASCAR’s Race Control as required by NASCAR and a fourth radio to scan themselves as a safety check to make sure all the radios they were using to communicate with the team and driver were broadcasting properly. Q: Most of the time racetracks are built more in the suburbs and rural areas rather than cities like a football or baseball stadium might be. What are some of the logistical issues that you must deal with and what are some of your favorite tracks to travel to for the food and entertainment outside the track? A: Well, this answer is a double edged sword. As much as I disliked spotting at Las Vegas, I enjoy playing Blackjack at the South Point Casino. It’s a new hobby I picked up while working the K&N Pro Series at Dover Downs two years ago. As for logistics, it’s pretty much the same every week. Most of the teams charter a plane and most of the teams are all on that very same plane. We’ll fly out of Concord and land at the closest airport that has a private (or seperate) terminal for private planes. Most teams have a rental van waiting for them and we’ll pile in that van with our luggage and either head straight to the track for tech day, or to the hotel we’re booked at and check in. As far as favorite tracks for food, nothing beats heading to New Hampshire and stopping at my favorite pizza place, Papa Gino’s Pizza. Daytona is always good for outside entertainment as well as Talladega and Charlotte. Texas is a new favorite because of Bone Daddy’s BBQ and Grill. Q: Correct me if I am wrong, but I believe Bowman Gray Stadium is one of your most hated places to spot at. Why is that and what other tracks present a real challenge. A: As a spotter, Bowman Gray Stadium is a great place to learn to spot. Things happen so fast there that it’s a lot like spotting at a flat Bristol. What frustrates me about the place is the way the rules are so loosely adhered to and it’s ran more like a WWF wrestling show on wheels than an actual NASCAR race track. Q: What about a favorite place to visit or spot at? A: Martinsville. Iowa. New Hampshire and Gresham Motorsports Park. Least favorite? Right now, it’s Las Vegas Motor Speedway. I’ve heard the sight lines at Phoenix are a nightmare, too. South Boston is also a challenge because of where the spotter’s stand is located at the top of turn one. My favorite place to visit is my home track, Stafford Motor Speedway in Connecticut. Q: What is it about Las Vegas that makes you say it is your least favorite track to spot at right now? A: Again, this is purely my personal opinion. To me, Las Vegas is spread out a little more than say Charlotte, or Texas. It’s basically like comparing it to a small Michigan or California. The sight lines for picking up your car on corner exit off of turn four and heading into turn one are a little tricky especially with the sun setting right into your driver’s eyes in turn four at the beginning of the race. Then later in the evening, you’ll see guys trying to go three wide into turn one and not have enough momentum to complete a pass since they’re stuck under two cars (or trucks) racing for position. With the aero deal the way it is right now, that’s a risky move that often doesn’t work. Q: Having been a spotter from local ranks all the way to Sprint Cup, can you relay a pinnacle moment or a fond memory? A: There’s been a few. Getting a personal phone call from Ryan Blaney to spot his non-companion NASCAR Camping World Truck Series races last year is the best one, right now. Spotting for Tommy Baldwin Racing and J.J. Yeley in the NASCAR Sprint Cup race at Dover a couple years ago also is one of them. That was a “right place at the right time” kind of deal. In my heart, I know I helped Dillon Bassett win the Martinsville 300 last fall which is the biggest NASCAR Late Model Stock Car race of the year. I truly enjoyed working with Dillon and our pre-race plans worked out perfectly until the final restart. Q: Part of racing is controversial decisions by sanctioning bodies. I know you wound up on the wrong end of a decision at Martinsville last fall. Can you explain that situation and what NASCAR ruled? A: As I just mentioned, that race played out perfectly to the way we had planned it earlier in the day. Dillon drove his heart out and followed my directions perfectly. We “lost” the race when the outside pole sitter clearly jumped the final restart before the designated restart point and the race director let it go. They said Dillon spun his tires but I hadn’t even clicked my button to tell him to go because he wasn’t at the designated restart point, yet. Q: Can you reveal any plans you have for 2014 or are you still working out the schedule? A: As of right now, I’m heading to New Smyrna Speedweek with my NASCAR Whelen Southern Modified Tour driver, Andy Seuss. I will probably spot the majority of his races this year and hopefully win my third NASCAR Whelen Southern Modified Tour Championship with him. I’m hoping to continue to work with Dillon Bassett again this year in some big NASCAR Late Model Stock Car races and go back and win the Martinsville 300 race this year. I’m also still committed to Ryan Blaney and Brad Keselowski Racing for another non-companion schedule in the NASCAR Camping World Truck Series.